On Friday October 19, 2012, the French Minister of Industry, Mr Arnaud Montebourg, paid an official visit to UKAD, together with 200 of the region’s key people, including business executives and partner companies. Besides the Minister of Industry, the Prefect of the Region Auvergne, Eric Delzant, the Mayor of Saint Georges de Mons, Camille Chanseaume, and other local councilors attended the presentation of UKAD process. They have also witnessed a titanium forging operation of the 4,500 T press. 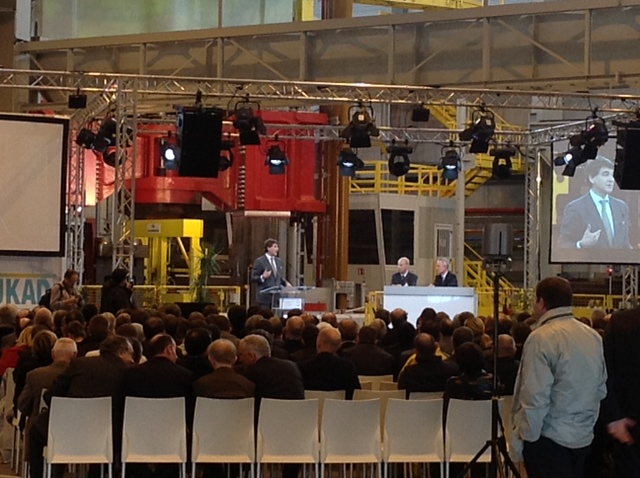 The day before, almost 150 customers from around the world also discovered the new facilities. On October 20, around 3,000 employees of UKAD and Aubert & Duval and their families could participate in the Open House. Copyright © 2011-2012 UKAD. All rights reserved.